Cairo: Kuwait intervened to help Iraq through its electricity crisis, sending fuel to operate the suspended power plants in southern Iraq and 17 generators, to mitigate the electricity crisis in Basra. Iraq electricity crisis started last week when Iran decided to cut electricity and fuel supplies. 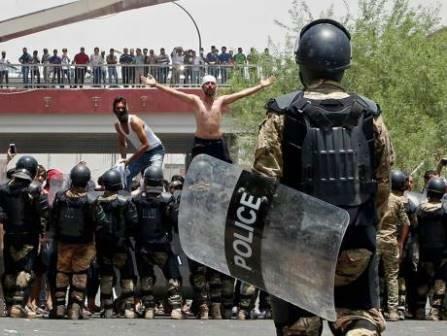 Nationwide protests were taking place for the last two weeks against miserable living conditions in Iraq. More than $40 billion was spent on electricity in Iraq, but the electricity crisis continues to spark popular anger due to mismanagement by energy ministries in consecutive governments. Nation is faced with acute electricity shortage amid oppressive summer temperatures, bringing air conditioners and fans to a halt. The severe drought is also forcing farmers to abandon summer crops. People in Baghdad get 20 hours of electricity a day while other provinces get 12 hours. According to the Ministry of Electricity Iraq produces 15,700 megawatts while it needs 23,000 per hour for a non-stop supply. An oil tanker has arrived in south Iraq carrying Kuwaiti fuel. The tanker loaded with 130,000 cubic liters of fuel docked on Monday at Basra port in south Iraq. The fuel which will be used in re-operating power stations that have gone out of service since last week. The aid was ordered by Kuwait's Emir Shaikh Sabah Al Ahmad according to the Kuwaiti Ministry of oil, which announced that more shipments will be sent in the coming weeks. Kuwait has also sent this week 17 mobile electricity generators with an overall capacity of 34 megawatts, according to Kuwaiti newspaper Al Anba. Earlier this month, Iran has cut electricity supplies to Iraq due to unpaid bills according to the Ministry of Electricity in Baghdad. The debt is estimated at around $1 billion. The Iranian step was seen as an attempt to fuel street protests in Iraq. An Iraqi cabinet delegation will reach Riyadh to begin talks in the coming days, "I don't think this problem will be solved in the next few months, and this is why we are going to Saudi instead," Al Hadithi Iraq Foreign Minister said in a statement. Saudi Arabia has sought closer economic and political ties with Iraq as the kingdom looks to counter Iran's outsized influence in Baghdad.